It's a common scenario: One person in a couple brings home a higher salary than the other, causing tension in the relationship. Money problems are often cited as a leading cause of divorce, and some experts say large differences in pay -- no matter who has the bigger paycheck -- can exacerbate these conflicts. "The classic understanding of the power differential in couples is ... the person with more money in the relationship has the power," said Marlin Potash, a psychotherapist who specializes in family and money issues. "The person who earns less can end up feeling their wishes and needs aren't as important and don't matter as much." "I make more than my man and I think it bothers me more than him," said Deona Brennan. Brennan, a 30-year-old ultrasound technician in Cape Cod, makes about $10 more per hour than her boyfriend, and said the difference makes planning for the future difficult -- especially when it comes to starting a family. "I am worried that if I decided to have a child with him ... of not being able to make ends meet on one salary alone." While she plans to continue to work after having children, she wants options. "I am not afraid to work and I want to work, but I don't want to do all the work." She recently chose to vacation with a friend instead of her boyfriend. "I didn't consider him as a partner to go with because of money. I didn't want to pay his way or make him feel obligated to pay for his part." The number of women out-earning their husbands is rising, due to an increase in their education levels. According to a 2014 report from the White House, 24% of married working women earn more than their husbands. That number was 7% in 1970. "Overall, in married households, the fathers still make more, but the lines are converging; they are heading toward each other," said Kim Parker, director of social trends research at the Pew Research Center. 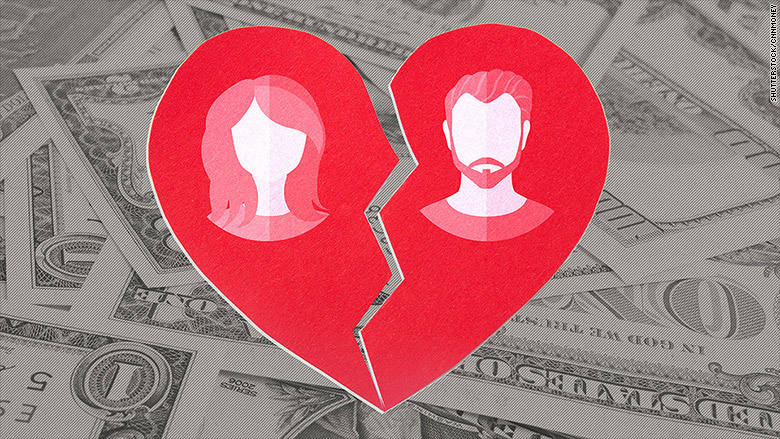 When women make more than their partners, it can have two different effects on a relationship, explained Olivia Mitchell, an economist and professor at the Wharton School of the University of Pennsylvania. The first, she said, is the independence effect. "It could lead to potentially higher divorces if [women] can leave a bad marriage and be financially viable." The other is the income effect. When there's a dual cash flow, there tends to be less money pressures. "In the old days, if the father lost his job, the family could have floundered," she said. Potash works with a young married couple with a pretty significant pay difference: she's in finance, he's in academia. They've decided to allocate their earnings proportionally to joint budget items like saving for a house or paying rent, and the rest goes into individual accounts. Younger couples tend to handle pay differences better, Potash added. Part of that could be because the wage gap has been narrowing among millennial workers. A 2013 study from the Pew Research Center showed that female millennials were making 93 cents for every $1 millennial men earned in 2012.